Highlights: Warriors beat Cavaliers in overtime in Game 1 of 2015 NBA Finals (+Mini-movie) - Balita Boss! 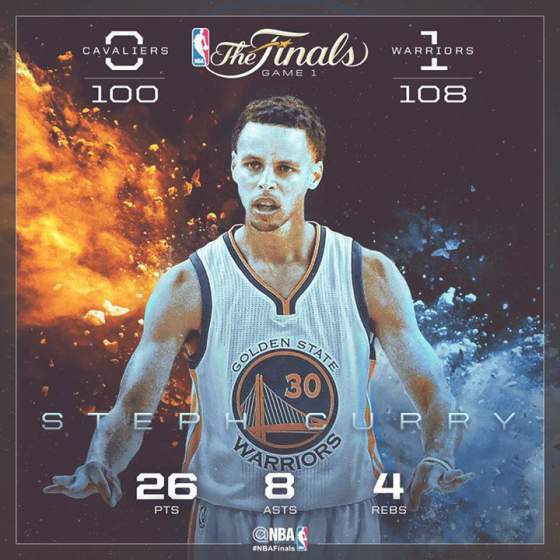 The league's MVP Stephen Curry had 26 points, eight assists, four rebounds and two steals to lead the Golden State Warriors in a win over the Cleveland Cavaliers in Game 1 of 2015 NBA Finals. Klay Thompson contributed 21 points six rebounds, one assist and one steal. Andre Iguodala came off the bench added 15 points on 6-of-8 shooting for the Warriors, who also had 12 from Draymond Green and 11 from Harrison Barnes. For Cavaliers, LeBron James, playing his fifth NBA Finals, finished the game with a team-high 44 points on 18 of 38 shooting, eight rebounds and six assists. Irving added 23 points, seven rebounds, six assists, four steals and two blocks. Unfortunately, he did not finish the game after aggravating his troublesome left knee in overtime. Timofey Mozgov scored 16 points and Tristan Thompson pulled down 15 rebounds for the Cavs.